This June, I’ve taken a trip to Siquijor and Dumaguete (Negros Oriental), including a side trip to Apo Island. Before anything else, here are my thoughts about this trip. I did appreciate Siquijor but wasn’t taken with it. I liked my visit to Dumaguete and Apo Island better. The city of Dumaguete is very chill, a convenient place to explore for a solo backpacker like me and the locals are very friendly. I also like the fact that it’s a gateway to a lot of places in the Visayan region. In particular, my side trip to Apo Island for an island hopping tour was very fun. To get to Dumaguete City, take a flight to Sibulan Airport. Regular fare is about P3000, but you can get promo tickets for about P700 one way. Once you’re in Dumaguete, it’s easy to get to Siquijor Island. Hail a tricycle from anywhere in the city and tell the driver to drop you off to the port. If you’re coming directly from the airport, make sure to walk outside the airport gates before hailing down a tricycle. There are habal-habal and tricycles within the airport perimeters, but as you can already guess, they are overpriced. From the port, ride a ferry bound to Siquijor (1 hour, P100-150 for a ferry ticket). Take note that the last trip from Siquijor back to Dumaguete is 6PM, while the earliest is 5:30AM. Here’s a rough guide for 3 days stay in Siquijor and Dumaguete. If you have another day, the best way to spend it is going to Manjuyod Sand Bar in Bais. Most people explore Siquijor in half a day, although if you don’t want a rushed schedule I recommend taking at least a whole day. You can also stay overnight and just check out early morning to get back to Dumaguete City. You can read about my trip to Siquijor here. Personally, I’m not interested in old churches and monasteries so I asked my guide to skip them. The places that I liked are: the enchanted balete tree, Cambugahay Falls, Salagdoong Beach, Tulapos Marine Sanctuary and Paliton Beach. Tulapos Marine Sanctuary is awesome, although it’s not as popular as the others. You can see baby sharks and sea turtles here, along with the usual fishes and other sea creatures during snorkeling. Paliton Beach is said to be the best beach in Siquijor, although it seems to require regular maintenance. Aside from the island tour, there’s also a mountain tour, which includes the lesser-visited attractions in Siquijor, such as the Cantabon Cave and the Butterfly Sanctuary. If you’re looking for other activities, you might also want to look at the dive sites in Siquijor. 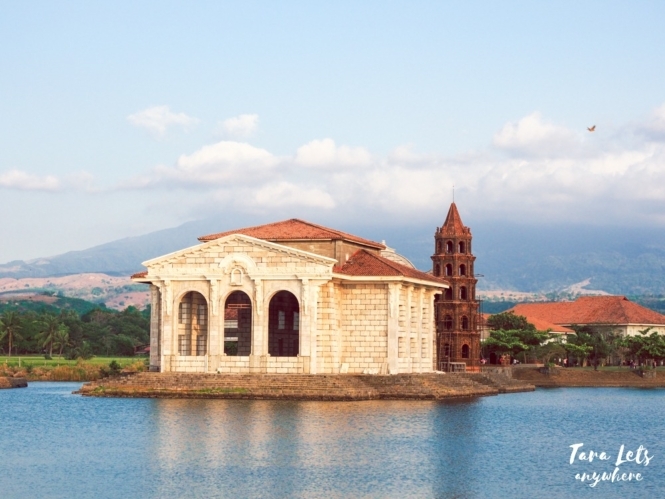 Currently, the standard rates for an island tour is P1000 for a tricyle and P1500 for a multicab. For a mountain tour, chartering a tricycle costs P1200. If you have a driver’s license and know how to drive, you can rent a motorcycle from your accommodation for P350 a day. I think renting a motorcycle is the best way to explore Siquijor, since I find public transport to be very limited. You can also visit the lesser-known waterfalls in Siquijor this way. Vehicles for tours are waiting at the arrival area in Siquijor port, so you don’t need to book in advance. I like Larena’s Triad Coffee shop, which offers the best view in Siquijor. The food is decent and reasonably priced. I’m not sure if it’s included in the island tour, but I think it can be made a quick detour. 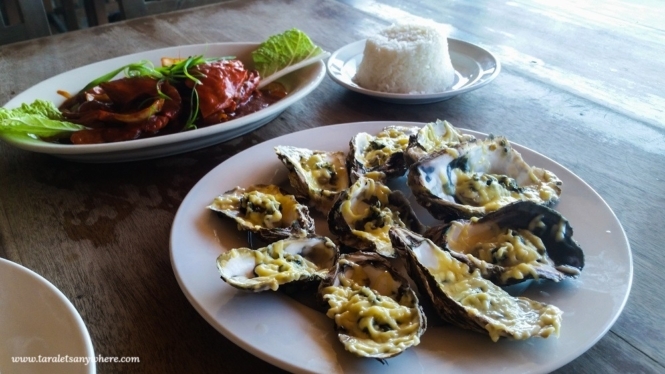 Baha Bar and Dagsa Restobar are also popular options for the seafood. Dumaguete City is a university town in the province of Negros Oriental. There’s not much to do in Dumaguete City itself, but it’s a nice place for food tripping or having a nice staycation. As you all know, it’s the origin of a famous recipe for sans rival and silvanas. Personally, I love the laid-back ambiance of Dumaguete City and its convenience. Everything is just an arm’s reach away! There are tricycles any time of the day and you only have to pay P10 for each ride. Another thing that you should know about Dumaguete great is that it’s a gateway for other nearby attractions in Negros Oriental. The places I visited are Apo Island in Dauin and the tourist attractions in Valencia. Apo Island is a great place for snorkeling and diving. Here you can see various species of corals, fishes and even sea turtles! I availed of a packaged tour from Harold’s Mansion for P1200, which includes round-trip transportation to and from Dumaguete City, lunch, snorkel equipment and lifevest and guide fee. The lunch was so-so but everything else about the tour was great. Our guide has been really helpful and helped me get great shots of underwater scenes in Apo Island. Transportation is also hassle free. Read about my trip to Apo Island here. 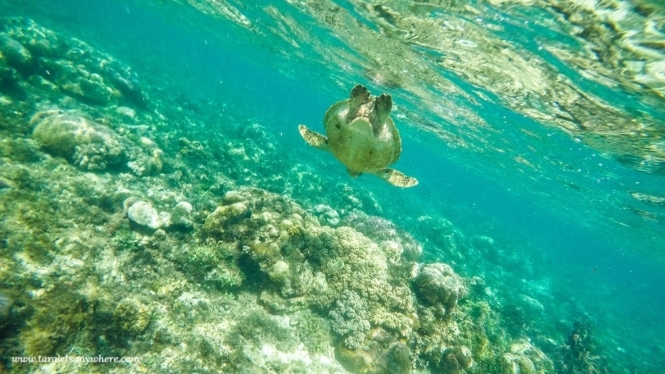 Sea turtle in Apo Island. While we’re at it, a good friend also recommends stopping by the Tabo Tabo market in Malapatay, another jump-off point to Apo Island. It is open every Wednesday. It’s described as a cultural experience: you can see goods sold by mountain farmers, including animals, as well as native food and delicacies. Valencia offers unique attractions: a falls surrounded with reddish rocks, mountain hot springs and (literally) smoking mountainside. To get here, simply ride a jeep from anywhere in Dumaguete and then hire a habal-habal to take you to the falls and hotspring for P200-300. If you’re going to the Pulang Bato twin falls and hot spring only, ride a jeep to Palinpinon (P20) and then hire a habal-habal from the jump-off point (P30). On Sundays, jeeps going back to Dumaguete are until afternoon only. Pulang Bato falls, surrounded by reddish rocks. The other falls in Pulang Bato. I passed by Tierra Alta on the way back from Valencia to Dumaguete City. This is the view from the lighthouse. There are two hot springs in Valencia: Red Rock Hot Spring and Ocean 24. A local recommended me the first because it has a more natural feel compared to Ocean 24. If you’re feeling adventurous, you can also proceed to Casaroro Falls. Dumaguete City is also connected via sea travel to various provinces in Visayas, including Siquijor, Cebu, Bohol and even Zamboanga. You shouldn’t miss having desserts at Sans Rival Cakes and Pastries. Hayahay Restobar and Atong Kamalig are also popular restaurants. You can also check out the local market for budbod and tsokolate. Seafood in Hayahay Restobar. Expensive but good. There are several beach resorts in Siquijor and it’s relatively cheap especially if you’re traveling with someone. You can get an air-conditioned room for around P1000 for 2-3 people. Most of the resorts are family owned, except for Coco Grove Beach Resort which is also one of the best, if not the best, resort in the area. I was solo so I opted to stay somewhere cheap — in JJ’s Backpackers Village. It’s situated alongside other beach resorts in San Juan. This hostel has a modern native decor, complete with bamboo bunk beds. Apparently it’s a favorite especially of foreign tourists, so make sure to book ahead. There’s an eatery about 10 minutes away from JJ Backpackers Village where you can eat for cheap. Looking for other accommodations in Siquijor? Check out resorts in Siquijor here. There’s actually a lot of options for budget Dumaguete City hotels and inns, starting from P300 above. The ones located downtown are popular, so if you’re staying in that part of the city it’s best to reserve in advance. Harold’s Mansion is possibly the most famous backpacker lodging in Dumaguete. Bunk beds in dorms are cheap, but for a little more you can have a single-bed aircon room in other inns. Harold’s Mansion is convenient because have Apo Island tours for joiners. If you’re looking for a little “extra”, Hostel Tropical holds seafood nights exclusive for house guests for less than P300 per person. Looking for other accommodations in Dumaguete City? Check out hotels in Dumaguete City here. You can easily spend as little as P5000 for visiting Siquijor and Negros Oriental if you’re traveling with at least one other person. Budget also largely depends on which tour you’ll take. I spent around P7000-8000 on my visit, which is 5 days total (excluding flights). I just had a Siquijor sojourn last March. Truly a magical place to spend summertime. Good details on your Siquijor travel guide. We haven’t been to Siquijor, but based on your photos and description, this place is magical! We will be putting this in our bucket list. Are there dive sites there? Not sure haha. 🙂 I think a lot of people go to Siquijor to chill. Hi there! Siquijor has dive sites, absolutely. You can search online and you’ll be able to find more info about them.